Today, Mother’s Day 2014, I am remembering my grandmas. This is a picture of my mom’s mom and my dad’s mom. They were both very creative and independent women. My mom’s mom, Betty Isler was a poet and writer. She published multiple poetry books. My dad’s mom, Katherine Kuhlman was fiercely independent and was a musician among other things. I remember her patiently trying to teach me how to play piano… I was one of those kids that didn’t practice much. I did not inherit the musical gene, although I do have a great appreciation for music. 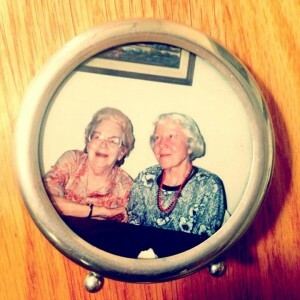 I am grateful to have had these two creative women in my life. 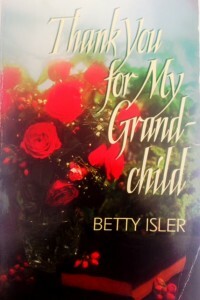 When I was younger, my grandma Betty Isler published a book called, Thank You for My Grandchild. I like the title. 🙂 She wrote one poem while thinking of my sister and I. It’s funny because when I first read the poem, I did not like it, now I love it. The reason I like this poem is because it reminds me to appreciate the simpler things in life. Things that are so easy to not notice these days in our rushed, crazy busy, glued to technology world. When I was younger and first read this poem, I did not like it from my feminist point of view. I was annoyed she was wanting women to be doing and enjoying things like laundry. As I have gotten older, I realize it is not about gender roles and who is doing what, it is about enjoying the small daily mundane tasks in life because really that is what life is all about. Now, I am hoping to channel some of their combined creativity and finish writing this book I started two years ago on Mother’s Day!